Activation: called internally by various Macro Express modules. 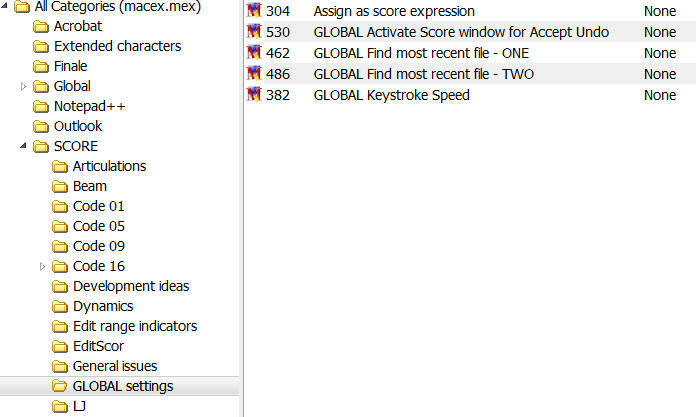 This macro activates the current ScorBox window after executing a specific procedure (for instance, after running an exterior executable, such as Beam, LJ, or EditScor). Many of those procedures, upon completion, display an “Accept the result” message, with which to accept or undo the operation. Once that message window is displayed, this macro will then activate the relevant Score window so that the results can be immediately reviewed by using navigation keys, such as the arrow keys, or Page up / down, etc. Otherwise, the “Accept the result” message would be the active window, and one would have to activate the relevant Score window first manually before being able to navigate. Therefore, the aim of this macro is to expedite the work flow a bit by eliminating the need to click on the relevant ScorBox window after executing a procedure.